For most homeowners, there isn't a lot of worry or thought about deck cleaning. Morton, IL doesn't usually think about it until you notice that your deck boards are warped and chipped from neglect. But we're here to help. With our patented process and restorative applications, we'll have your deck looking brand new in no time. Is your deck looking a little worse for wear? We can fix that. When it comes to deck cleaning, Morton, IL can trust us to deliver. With our fast, dependable service and non-toxic formula, we'll leave you deck looking like it was just built today. Give us a call if your deck isn't quite as vibrant as it used to be. 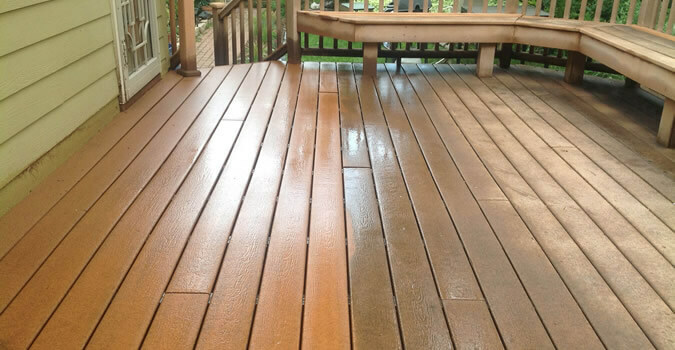 Call us at (888) 664-9441 for full service deck cleaning, Morton, IL! Prices are no issue for our deck cleaning, Morton, IL. We're a great value at a great price, and we've got the math to prove it. Scroll below this wall of text to see how you can benefit from our top-notch deck cleaning services. We'll show you how we rack up against the competition.